Who Are Your Fave Pop Culture Moms? Time Magazine has a fun double-your-pleasure story about pop culture moms. 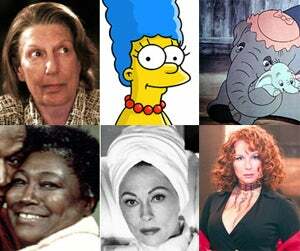 The "Best Moms Ever" include Florida Evans from Good Times, Marge Simpson, Rusty Dennis (as played by Cher) in Mask and Dumbo's mom. On the "Worst Moms" list are MomCorp's Mom on Futurama, Livia Soprano, Medea, Margaret White from Carrie and of course, Joan Crawford as played by Faye Dunaway in Mommie Dearest. Now, her mothering skills may be questionable, but one of my favorite Moms is Edina Monsoon, because she is shamlessly shallow and revels in her self-centered insanity. I also like Mrs. Potts from Beauty And The Beast. The other Jezebels unanimously voted for Lucille Bluth from Arrested Development. Elise Keaton from Family Ties got a vote, as did Angela's Mom from My So-called Life. (Poor Patti Chase!!!) No one voted for Mrs. Cunningham from Happy Days, but she has an interview on EW.com so there's that. Surely we're forgetting some memorable moms? Let us know!